The morning came too early to suit Simeon. The clatter and mumbling rush of the city's people robbed him of his only moments of peace--sleep. And sleep did not come easily for the old man, but then nothing ever had. Sometimes at night he just couldn't seem to get comfortable. On nights like those he lay awake--thinking, remembering. The census had forced the migration of many people into Jerusalem. Now the city was rarely quiet, even at night. Only a few ever worried about disturbing the sleep of a tired old man. Once in a while Simeon wondered what death would feel like. He figured it had to be quieter, at least. Such thoughts were not morbid. After all, he lived with death almost daily. Most of his friends, the ones he'd played with as a boy and worked with as a man, had died. The younger people he knew all treated him like a fragile invalid. Occasionally he surprised one of them with a flash of wit or insight, but not often. It had all been bearable as long as he had had Esther. But then even she had been taken from him. Her passing was an old wound now, but he still felt the pain. The days and nights of the past few years seemed even lonelier because she no longer shared them with him. Simeon stroked his long, white beard, tangled from his troubled sleep, and stared at the ceiling from his bed. Some days it took all his strength just to get up. He slid his feet out of bed and hobbled over to the cooking fire. Stoking the little fire, he let it warm the porridge in the pot dangling above the flames. With most of his teeth gone now, porridge was his main dish. Fortunately, he liked it. Simeon dipped out a bowlful and ate his breakfast thoughtfully. While he ate he watched the spider in the window. Simeon and the spider knew each other well, or he liked to think so. Each morning the old man watched the creature crawl out on its web, glittering with dewdrops. The spider spun line after line into a fine mesh, the web growing daily. Esther had always considered spiders a nuisance to be smashed, their webs swept away with a broom. "That spider is just like the Jewish nation," he had reprimanded her time and time again. "Every time we attain a comfortable, profitable life, we forget that God provided it for us. We begin to congratulate ourselves for the fine work we've done. Then God allows an enemy to come along and to sweep away our comfortable lives. And we have to start all over again, those of us who live through it. That's where we are now. Rome swept us away. But someday the Messiah will come and overthrow our enemy. Then we can build again!" "You're just a foolish old man," Esther would scoff. But she left the spider web alone, for a while. Now the web covered the window. Simeon hadn't the heart to destroy it. But he'd changed his mind about the symbolic meaning of the web a few months ago. "Esther was right," he muttered aloud. "I am just a foolish old man. I thought I knew God's plans." Simeon knew that when the Messiah finally came, He would not concern himself with politics. Rome wasn't the real enemy the Jewish nation faced. He felt sure of it. The message had been too clear. The message had come to him somewhere between the darkness of late evening and the blackness of early morning. He had been studying the scroll of Isaiah, one of the few sacred writings he had managed to purchase over the years. The Holy Writings occupied his mind and helped him forget all the sadness. He had always favored Isaiah because it contained so many of the Messianic prophecies. The flickering light of his cooking fire and the steady glow of the candles illuminated the writings spread across his workbench. The light was dim and his eyes not quite what they used to be. He rubbed them with his finger tips, praying wearily in his mind. "How long, Lord God of Israel? How long must we endure Rome's presence? I have looked for the Messiah all my life, but He has not come. When will He set us free?" "Soon, Simeon, soon," a voice answered his unspoken prayer. Simeon glanced up from the scroll, startled. A man clothed in the garb of a traveler stood in the doorway. And though he was not dusty from walking, Simeon had the impression he had traveled a great distance. He seemed ordinary in every way, except for the glimmer of starlight in his eyes. "Who are you?" Simeon asked, starting to get up, for he had not heard the door open or the stranger's approach. "I am a messenger of the Most High." Simeon sank back in his seat. He would have knelt, but he could not find the strength. "You are blessed, Simeon, for the Lord looks with favor on your honest search for truth. He will grant the answer to your silent request." The old man could only stare. He felt no fear, just incredible surprise. "Simeon, seeker of the Messiah, you will not see death until you have seen the One who is to come! But understand this. The Son of God has concerns far greater than Rome. Look again to the prophecies." Simeon blinked and started to reply, but the stranger had vanished. The door opened onto the night. Finishing his morning meal, the old man methodically cleaned the bowl and set his house in order for the day. It required little effort. As he stood on the threshold of his small house, a soft wind blew across his face and rumpled his beard. It seemed to tug at him. "Come, Simeon," the wind whispered to him, and he obeyed. He let it guide him up the narrow streets of Jerusalem into the wealthier sections of the great city, closer and closer to the Temple. Moving slowly, for Simeon had no schedule to keep and preferred it that way, he came at last to the massive walls of the Temple. "Go in, Simeon," the wind seemed to say, and he did. The courtyards and halls were very familiar to Simeon. He came here often to pray and meditate, to search the faces of other worshipers as he looked always for the Messiah. Lately he had begun to worry that when he did see the Messiah, he might not recognize Him. For this reason he prayed fervently that he would not be blinded to the Son of God. From where he stood, Simeon could see a small gathering of young couples. Mothers cradled newborn infants in their arms. He often watched the purification ritual for new mothers and this redemption ritual. Jewish law required mothers to offer a burnt offering for purification and parents to present their firstborn sons to the priest, redeeming them with a payment of five shekels. The ritual of redeeming all firstborn males had originated in Egypt when God claimed Israel as His firstborn and punished their captors, the Egyptians, by destroying all the firstborn of Egypt. Simeon noticed one couple in particular. Obviously wealthy, the parents waited their turn and occupied themselves by talking in low tones and cooing at their baby son. 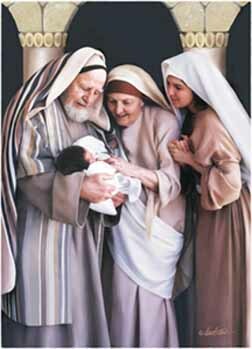 The old man felt sure that the Messiah would be born into such a family. Wealth was a blessing from God. Surely His own Son would have every advantage. The priest had just finished presenting the son of a poor family to God and offering the mother's purification gift--the token sacrifice of two young pigeons, which poor people substituted for the more expensive lamb. "What is the child's name?" the priest asked routinely, waiting to record the name. "Jesus, son of Joseph," the father answered proudly. Something in the father's voice and in the mother's gaze struck a resonant chord in Simeon's memory. Had the angel mentioned the Messiah's name? He didn't think so, but something about these two simple peasants called out to him. Simeon felt the weight of a hand on his shoulder and heard the whispered words, "He is the One, Simeon. Go and bless Him." He turned around, but there was no one behind him. Moving with determination and conviction that astonished the officiating priest, Simeon took the child carefully from the mother. After searching the infant's face, he lifted the baby toward heaven, his voice surprisingly strong: "Sovereign Lord, as You have promised, now dismiss Your servant in peace. For my eyes have seen Your salvation, which You have prepared in the sight of all people, a light for revelation to the Gentiles and for glory to Your people Israel!" He turned back to the parents and quietly returned the baby. Words of blessing spilled out: "Peace and joy to you all in the name of the Lord!" Turning to the woman, he uttered words that later he himself did not fully understand: "This child is destined to cause the falling and rising of many in Israel, and to be a sign that will be spoken against, so that the thoughts of many hearts will be revealed. And a sword will pierce your own heart too." From behind him another voice, cracked with age, began praising God and confirming Simeon's pronouncements. The prophetess Anna, who lived in the Temple, stepped forward. She too blessed the child and His parents. But Simeon did not stay to hear much of it. He felt suddenly tired, very tired, and he wanted only to lie down in his tiny house. Simeon walked slowly away, aware that many eyes followed him as he left the Temple--some not kindly. But it didn't matter. He had seen the Son of God. Shuffling through the streets of Jerusalem, Simeon made his way among the hurrying folk of the city. He did not share their urgent need for speed. The Lord's timetable was accurate. It needed no rush and knew no delay. The old man seated himself on a low bench in front of his small house, deciding to rest for a short time before going inside. The sun felt warm on his upturned face, and the pain in his joints eased. Simeon prayed silently thanking God for allowing him the privilege of seeing the Messiah. Joy welled up in him, and he felt content. He wished he weren't so tired. The sun and gentle wind combined to make him sleepy. Simeon leaned back against the wall of the house, relaxing and letting sleep take him. He would just rest a little while, then go on about his business. Just a little while.